If you want to find out all the new goodies Android's newest upcoming OS, codenamed Gingerbread, is going to bring, you may want to ask Satya Komatineni, Sayed Hashimi, and Dave MacLean. These 3 writers are the co-authors of the Pro Android book series, and, thanks to a tip from @brodduncan, we now know they've definitely been playing with Gingerbread, likely for quite a while. Pro Android 3 shows you how to build real-world and fun mobile applications using the new Android SDK, codename "Gingerbread." The above confirms our earlier suspicions of user interface improvements that Gingerbread is bound to bring as well as reaffirms the WebM integration that Google promised at Google I/O this year. Unfortunately, the carefully worded "and more" part leaves us hanging just when things were getting interesting. According to Amazon, the book is going to be released in January 2011, but after digging around, I found this Apress site for Pro Android 3 showing a December 2010 date instead. 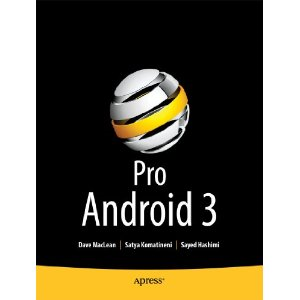 "Pro Android 3 (eBook)" has been added to your shopping cart. It is an Alpha Book and so is in an unedited unfinished pre-release format. The full book isn't available yet, but when it becomes available, you will be able to download the full eBook. Whether the 7 exposed articles offer any information about Gingerbread or not is unknown, but they can be unlocked for a cool price of only $34.99, which will let you download both the pre-released chapters and the book when it is out. In case you were going to order it anyway and want to take Apress up on this advance offer, we would appreciate if you shared your findings in the comments or via the contact page. P.S. If you know the book authors and have access to a large quantity of wine, you know what to do (but you didn't hear it from me).